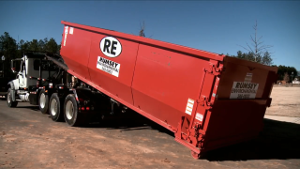 Rumsey Environmental provides a variety of construction waste removal containers and open top roll-offs for your work site. From small home remodeling and junk clean-outs, to large construction projects and work sites – Rumsey Environmental prides itself on furnishing quick, safe and efficient delivery and service by our experienced and DOT approved drivers. Whether commercial waste container is for one-time use, temporary rental, or permanent placement, we can help furnish the right size container for your needs. Enter your information to learn more about commercial roll-off dumpster services in your area.